Study for "Paysage Marocain Sable Orange"
The Tibor de Nagy Gallery is pleased to present an exhibition of paintings and works on paper by the noted American artist, who lived in Paris for over fifty years. This marks the second exhibition with the gallery. The exhibition will focus on the various locales the artist painted over the years, including Provincetown, Seville, Venice, Paris, the French countryside, and Marrakesh. Over the years the artist developed a style which was a synthesis of early 20th Century French Modernism and a painterly directness that brings to mind Abstract Expressionism. Included in the show is a group of Paris cityscapes, including views of Les Invalides, the Seine, Notre Dame, and the garden at the Palais Royal. There are several large-scale works of Venice, with its grand canals and dramatic façades, that were painted when the artist was well into her eighties. The artist employed bold, simplified shapes to capture the buildings and the specific light of each city. For the first time, the gallery will exhibit a series of the artist’s works on paper, many of them collages of Spanish cities, as well as others of Paris. The artist was born Janice Tworkovska in 1903 in the town of Bialystok, Poland. 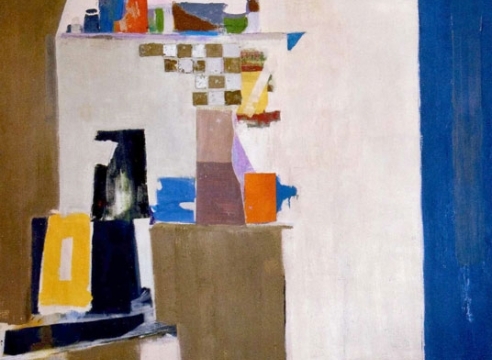 In 1913 she immigrated to the United States with her mother and brother, Jack Tworkov, the noted Abstract Expressionist. She began studying art with Edwin Dickinson at the National Academy of Design, and later, at the Art Student’s League. She started to exhibit her work under the name Biala, after her birthplace. During the artist’s first visit to France in 1930 she met influential British novelist Ford Madox Ford. They would remain together until his death in 1939. She would return to live in Paris in 1947, with her husband Daniel ‘Alain’ Brustlein, an acclaimed cartoonist and accomplished painter. Biala’s paintings have been the subject of numerous gallery exhibitions in New York and Paris, and were included in major museum exhibitions including five Whitney Annuals. She had seven solo shows with the legendary Stable Gallery, and during her time in New York was at the center of a group of Abstract Expressionists, including Willem de Kooning. Her work is in many museum collections in the United States and France, including the Whitney Museum of American Art, New York; the Phillips Collection, Washington, DC; and the Centre Pompidou, Paris.